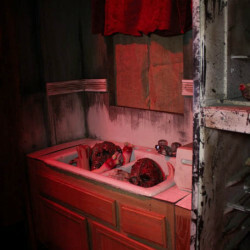 ← House of Shock Resurrected and Open in New Orleans! The story line isn’t necessarily a linear one at Perdition Home – the feel and style of the maze however, doesn’t stray from a singular flavor, if you will. 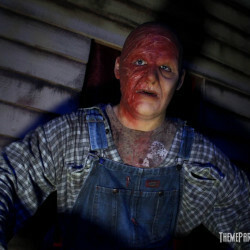 For the last couple of years, Perdition Home has been a freakish hillbilly-type of experience; a Texas Chainsaw Massacre style of theme, which always works well for haunted attractions. 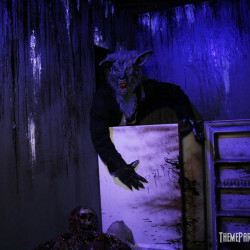 It’s an easy “get” for visitors to understand and relate to, which makes the creative side of things fairly simple for haunt owners Brandon Spletter, Trevor Nielsen, and a close team of family and friends that help out each year when putting this labor of love together for the community to enjoy. 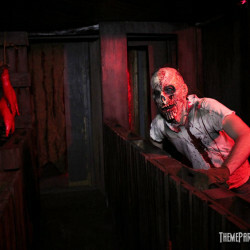 What we find really impressive about this haunt, is the really well thought-out layout each year; the footprint is compact, and the flow of the maze is absolutely disorienting; much longer in length than one would imagine, with rooms, gags, and live talent the entire way. If this team goes professional, we wouldn’t be surprised at all – they’re truly that good. 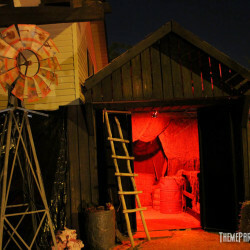 The outside of Perdition Home is fairly box-like in appearance; other than the entrance, this home haunt is nondescript. Brandon is an artist however, and his work has been blown up to become the “flash” of the structure – meaning, it’s covered from top to bottom with his designs, the same way a haunted house/fun house at a fair is; we love this touch, and find it to be a really creative solution to masking the otherwise-ordinary black box sitting in the home’s driveway. Lines can get long for Perdition Home, but they have a good capacity and tend to move a lot of bodies through when necessary. 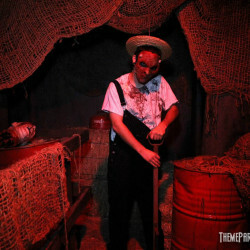 This is a free home haunt, although donations are encouraged and always gladly accepted; these guys work their butts off, so show them some love when you stop by to check out their special brand of blood-drenched terror! 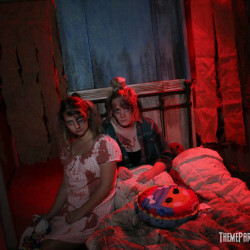 Home haunts tend to have issues with talent; whether it’s a cast of pre-teens trying to be scary, or folks who simply want to “help out” that aren’t true haunters, one big challenge that we often see are gorgeous home-made attractions with less than stellar “talent”. This is not the case with Perdition Home. 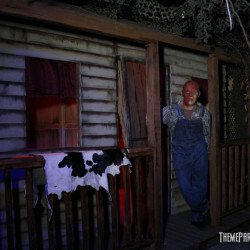 Just about everyone we’ve ever encountered in this home haunt is on fire – ready to get in peoples’ faces, and scare them senseless. Their energy and enthusiasm is always fantastic, and they absolutely are comfortable in their spaces, knowing the ins and outs of the structure and their surroundings perfectly, using it all to their advantage – and to your disadvantage! Huge props to the Perdition talent; it’s always fun shooting this maze, because they know what to do, and aren’t shy of our cameras! While there’s no doubt that this team has the concept of props and visual design down solid, they also really are aware of the importance of audio in their haunts, too. This is something that many haunters completely drop the ball on – sound. 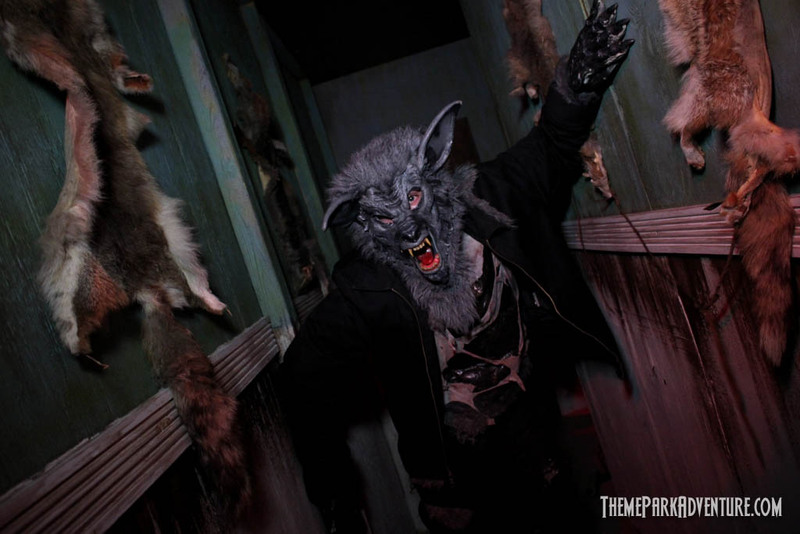 Perdition Home has always had appropriate, really great audio to accompany their attractions, and we respect the hell out of that. It’s shocking how much music/soundscapes make a difference in any attraction – we go through haunts of all types each season that have very little, if any, music or sound effects in use – and it makes us wince. 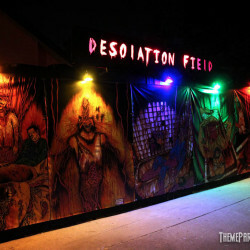 Perdition looks and sounds great each season; these guys may be “home haunters” but they are absolute pros in execution and technique, making this a must-see Halloween haunt each year! 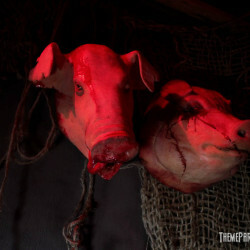 Check out Perdition Home’s official site for dates, hours and specifics. 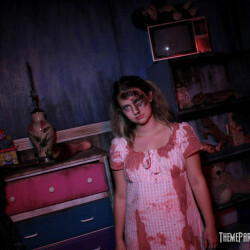 Then, make your way to Yorba Linda and experience one of SoCal’s finest home haunts for yourself! Tell them you’re a TPAer – they’ll love that! 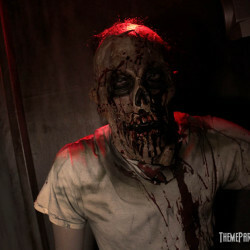 This entry was posted in Features, Haunted Attractions, Home Page, Home Page Slider and tagged Brandon Spletter, Perdition Home, Rick West, Trevor Neilsen. Bookmark the permalink.